I am a huge fan of Red Skelton, and one of my pet peeves is that even though he had thirty years of prime time television series, it’s not rerun anywhere. Therefore, I m truly grateful for Red Skelton – America s Clown Prince. In short, it simply is a 6-DVD collection of The Red Skelton Show (technically, a 5-DVD collection of the TV series, with the 6th containing some odds and ends, such as appearances in Sparks, Nevada, movie trailers, Red Skelton’s presentation of the Pledge of Allegiance, etc.). The negative is that some of the shows are quite grainy, but that’s to be expected, since these date from the 1950’s and 1960’s. Some of these I’d seen before, and some of them were the first time I’d seen them, which made them especially sweet. There s a wide selection of Red Skelton’s numerous characters, from the well-known hobo Freddie the Freeloader, country bumpkin Clem Kadiddlehopper, con artist San Fernando Red, henpecked George Appleby, punch-drunk boxer Cauliflower McPugg, cowboy Deadeye, the souse Willie Lump-Lump, as well as some lesser-known characters such as Weepy. Willie Lump Lump wins on a quiz show? 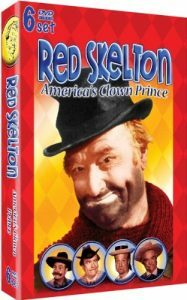 RED SKELTON – AMERICA S CLOWN PRINCE – 30 HILARIOUS EPISODES – 6 DVD SET! Among America s great comedians, Red Skelton is certainly the most beloved, along with his gallery of characters, including Clem Kadiddlehopper, San Fernando Red, and of course, Freddie the Freeloader. Red Skelton entertained us with his charm, wit and warmth for decades, on stage, on radio, in the movies and on his hit television program. Movie and television stars lined up to appear on his television show, week after week, year after year, entertaining us and themselves in funny skits with Red. Whether you have been a long-time fan, or are just discovering America s Clown Prince, this special 6 DVD disc set is a must-have collection of Red Skelton s unique comedy genius. Watch Clem and the Dalton Girls, Humphrey School of Dramatic Arts, Clean Fighter, Deadeye and the Alamo, One Good Intern Deserves Another, Clem in Dogpatch, GI McPugg, Clean Politics, Deadeye and the Gunslinger, The Sultan, Marooned, Fancy Footwork, San Fernando in Alaska, The Stagecoach Robbery, The Hobo s Dilemma, Willie and the Burglar, Quiz Show Winner, Whistle Stop, Lillian Martin, Freddie s Romance, Flugelmeyers  Secret Formula, The Railroad Station, Indiana, Desert Island, Freddie and the Baby. Red s famous Pledge of Allegiance and much more!